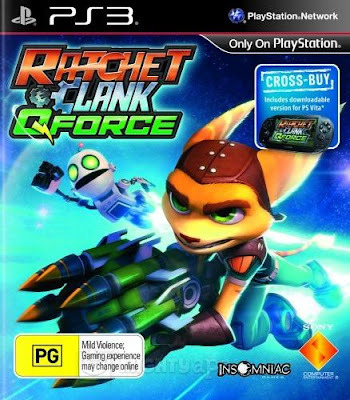 The PlayStation Vita version of Insomniac's hybrid tower defense-action game Ratchet & Clank QForce/Full Frontal Assault hits the store next week. If you have a PlayStation 3 retail copy of the game you can download the Vita version to your PS3 and transfer it to your Vita by accessing the "Disc Benefits" option from 22nd May. If you downloaded QForce on PS3 the Vita version will appear free on the PlayStation Store. I for one have been looking forward to this. Grip Games has announced Atomic Ninjas a multiplayer action platformer for the PS3 and Vita. This unique and original game introduces several twists that reinvent the traditional 2.5D platformer genre. Grip games, a privately owned developer and publisher of games for game consoles and high-end portable devices, announced today it will launch Atomic Ninjas, a multiplayer action platformer game for the PlayStation 3 system and PlayStation Vita system. The game will be available exclusively on the PlayStation 3 system and PlayStation Vita system as a downloadable game via the PlayStation Store throughout North and South America, Europe and other territories this summer. Atomic Ninjas is a 2.5D multiplayer action game, in which the player controls super-powered ninjas in frantic online matches against other players or bots. While the game relies on traditional jumping and shooting mechanics, it offers several twists that will make Atomic Ninjas unique and original.